This note is about a very small effect that we can normally ignore and usually do. 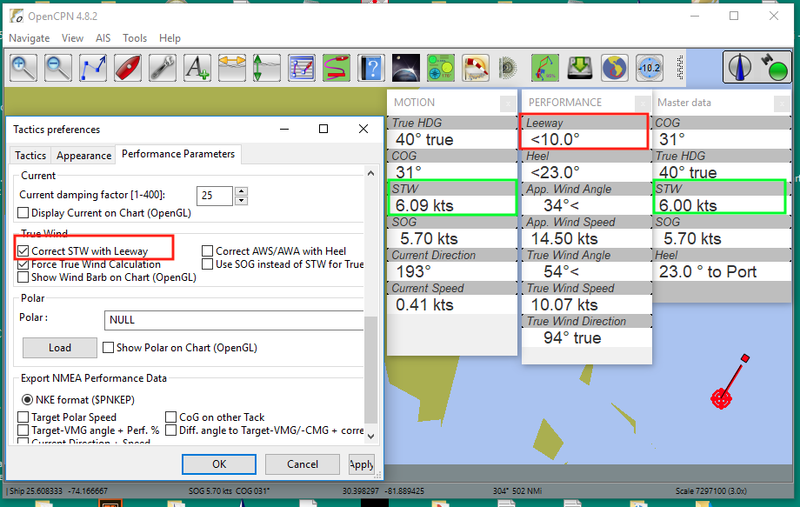 But when it comes to optimum sailboat routing computations, small effects can matter, so we have to address all we can. There are so many unavoidable uncertainties in the process, we are obligated to do our best to correct the ones we know about. One key thing we need in routing is accurate true wind so we can monitor our progress properly and also build proper polar diagrams from measured wind and performance data. 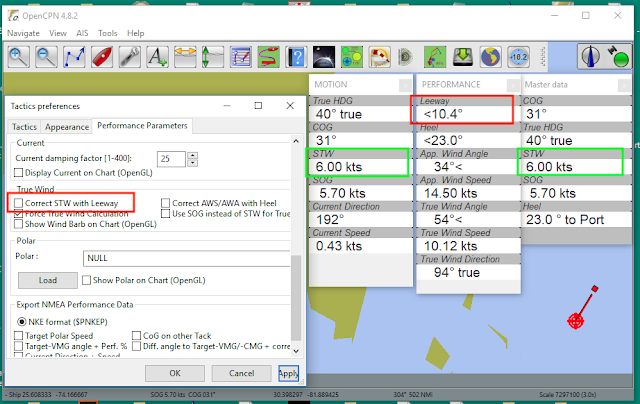 With no current and no leeway, we can figure true wind (TW) from apparent wind (AW) in standard ways using either knotmeter boat speed (BSP) and true heading (HDG) or SOG and COG. As soon as we have current or leeway, things get more complex. We address these issues in the new third edition of Modern Marine Weather, but one of these small effects is just stated without further illustration, and this note is intended to clarify that point. Namely, when a knotmeter paddlewheel is slipping through the water when we have leeway, it is not measuring the speed we want. It displays BSP, but we want the actual speed through the water (STW), which is slightly different. Figures 1 and 2 show a typical knotmeter assembly and the paddlewheel. Each blade of the paddle wheel has a small magnet inside, and each time it passes a closed wire loop it generates a small electric current pulse in that circuit. The rate these pulses are received is converted to a boat speed, and the integrated sum of the pulses is converted into a log record (odometer) of distance traveled through the water. Figure 1. A knotmeter through-hull fitting. Figure 2. The paddlewheel (these may be from different models). Figure 3 shows the geometry of the paddlewheel slipping through the water in the presence of leeway. 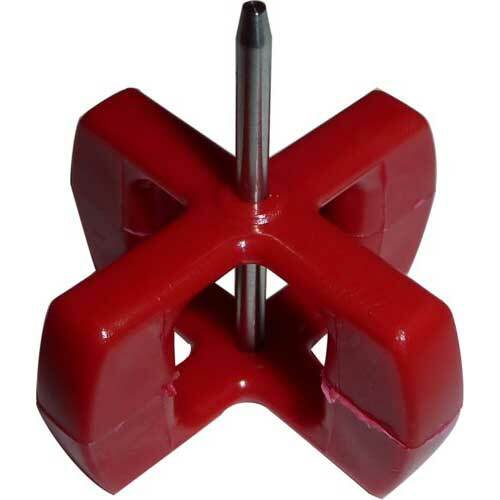 The idea here is, since the axis of the paddlewheel is rigid, the only component of the motion that turns the wheel is that which is perpendicular to the paddlewheel, which is not a true measure of how fast we are actually moving through the water. Recall that leeway, unlike current, is actual motion through the water. You are sailing, just not quite in the direction the boat is pointed. A common way to estimate leeway digitally for routing is to compute it based on the measured heel angle. This means that you have to measure leeway directly a few times for your boat do determine the value of k, which typically varies from 9 to 13 or so and may vary with wind speed. Generally leeway is only a factor going to weather. For modern sailboats, it diminishes quickly as you fall off the wind. 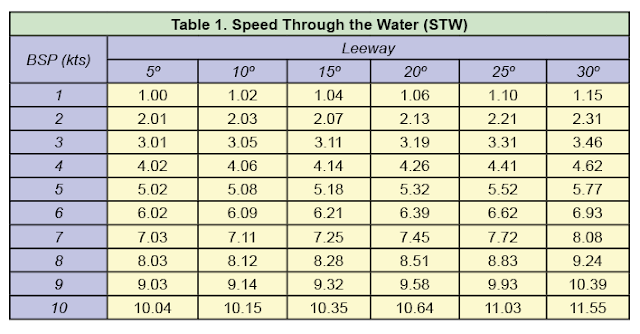 Note leeway is large for low boat speeds. 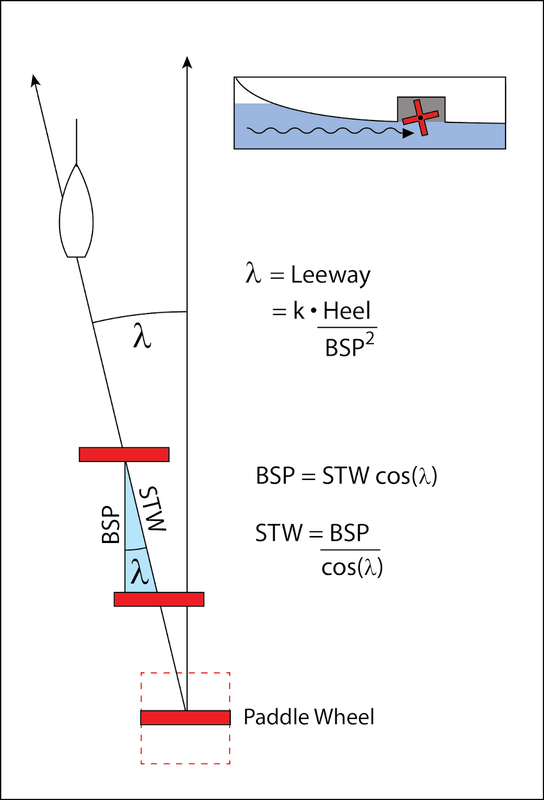 BSP is what is displayed on the knometer read out, but you are in fact going slightly faster than that at normal heel angles. Numerical values are shown in Table 1. 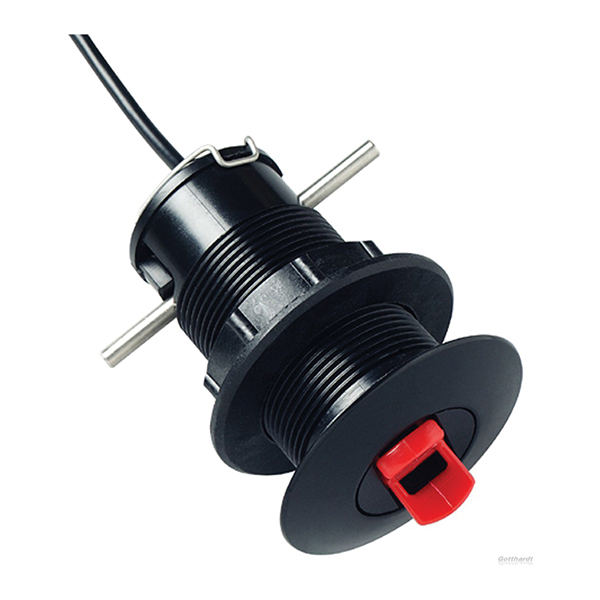 Some wind instruments and associated displays account for this if they include a heel sensor. Navigation programs that compute accurate true wind account for this as well, if they ask for leeway or heel inputs. The distinction between BSP and STW is noticeable in some displays; in other cases, the correction is used in true wind computations, but it does not show up in the displayed BSP. Below is an example from the Tactics plugin to OpenCPN, which does show when it makes this correction. In this picture the right hand panel is the normal OpenCPN dashboard; the left two panels are from the Tactics plugin. With "Correct STW for leeway" shut off, the two STW displays are the same—OpenCPN does not use the term BSP. Below, when we turn on the correction, the value shown in the Tactics display reflects the change. Figure 5. OpenCPN with Tactics plugin, correcting BSP for leeway turned on. Compare results with Table 1. To make these tests, we simulated the NMEA input (GPS, wind, heel, current, HDG, BSP) using the NMEA Converter plugin to OpenCPN. We encourage the use of OpenCPN in our Inland and Coastal Navigation course and in the Marine Weather Course. To that end, we have several videos on the subject of loading charts (see below) and other maneuvers. For now, however, the goal is to get our one training chart into the program as directly as possible. Later you can look over other options. Once the training chart is installed you can start working the practice exercises on an echart as you work them as well on a paper chart. Step 2. Go to www.starpath.com/navbook and download the "RNC of 18465TR," and then move that zip file to /mycharts. That file is called 18465TR.zip. Step 3. Unzip that file so the contents remain in the /mycharts folder. That process will create a folder with the name 18465TR, and that folder will include 3 files. Step 4. Open the program OpenCPN, and click the wrench, and then, charts icon on the top, then click far left tab Chart Files. This may yield a blank field or there could be paths listed that you added earlier. Step 5. Click Add directory, then navigate to the folder you have created called 18465TR, highlight it and press Apply. You should now see something in the field called /Users/computer_name/Documents/mycharts/18465TR. Then press OK. and we are done. Step 6. Go to wrench, then Display icon, then General tab, and in Chart Display, uncheck Enable Chart Quilting, and in Dissplay Features check Show chart outlines. Press OK. Step 7. On the base map background pan around to the Pacific Northwest and you should see a small red square over the Eastern Strait of Juan de Fuca. Zoom in on that and when it is about 20 or 30% of the screen chart will show up in the chart bar as a blue line. Click that line and the chart should appear. Once you have found the chart, you can return to the display settings and turn off the chart outline option as we do not need that with just one chart. Below is a video that shows this process. Then later on you can look over the full discussion of loading charts. If you are not a Starpath student then you might prefer a different chart for this start up. You can choose one from NOAA interactive viewer. They will be some 4 times smaller and look pretty much the same. Here are the two short follow ups which would be the next step to using the electronic training chart to practice echart navigation. Choosing, loading, storing, displaying and updating charts is an issue with all electronic charting systems (ECS). It is fundamental that we learn the details for the program we choose. Some programs have more convenient ways than others, but some of the most convenient interfaces do not offer as much versatility as others do. In our Inland and Coastal Nav and Marine Weather courses we use OpenCPN. It has a remarkable versatility on chart options, but like any ECS there is a procedure to learn. To try to help with that, we have made a few videos on the topic, breaking it down into topics. These are designed primarily for our students, but if others might find them useful, all the better. Some ECS, if not most, refer to this process as "installing charts," but that simply means that we download the charts by some means, either with a tool or manually, and then copy them to a folder on our hard drive, or on a network drive. What is actually being installed and saved with the program are a few lines of text that tells the program where the charts are located on our computer. For the quickest access to actual charts, you could go to #2, download all the charts for your state, and skip the rest. OpenCPN is the only program I know of lets the user select the resolution of the background. They do this to accommodate computers of all types and levels—some ECS, for example, require the latest operating system and a fast computer with a lot of memory. So the first topic addresses updating the stock base map with one of higher resolution. This is not strictly required, as the charts will overlay them, but it does offer a better echart experience. Later we cover cases where it does matter. There are two basic types of echarts, RNC and ENC. For now we are looking only at the RNC, which are images of the paper charts. There is much virtue to the vector charts (ENC), and we will add notes on these shortly. We have done a lot of work on these and have a textbook devoted to them. This tool not only loads the charts but sets them up to automatically updated. The only issue, as noted in the video, is we must know the actual name of the chart, as it does use chart numbers. We can identify charts we need from the top link at www.starpath.com/getcharts. We can also load charts manually, which comes up periodically. It takes an extra step or two, but for some special charts it is needed. OpenCPN also has easy access to other charts, both RNC and ENC. The video below outlines a couple of these, official charts from Brazil, a custom made training chart that we use in the Nav Course, as well as automatically georeferenced weather maps that we access via the weather fax plugin. The Chart Sources section of the online manual lists other sources of charts as well. Finally we address more details of base maps, which will come into play when we start doing optimum weather routing with the weather routing plugin. This is definitely extracurricular, and not needed till we work with weather routing. I will try to group these together at YouTube for easier access, but for now this index might help pull this sequence out from the others we have on related topics, some of which are outdated.